SCDG managed and delivered the post-hurricane Katrina effort of an inclusive nationwide coalition on health, rebuilding, land use and community restoration, racial justice and environmental quality. Delivery included the national 50-member multi-stakeholder planning committee; communications, scheduling, logistics and contracts; agendas, materials, speakers; teleconference and meeting facilitation; convening and facilitating the regional conference. US EPA, ATSDR, CDC’s National Center for Environmental Health, Kellogg and Ford Foundations and SCDG partnership. Leaders including US EPA Administrator, Lisa P. Jackson, Rep. John Conyers, Jr., former Congressional Black Caucus Chair, Rep. Emmanuel Cleaver, Georges Benjamin of the American Public Health Association, former Governor Parris Glendening and four US EPA Assistant Administrators addressed the attendees. SCDG collaborated with co-hosts US EPA, the North Carolina Community Development Initiative, State agencies and leading universities and organizations in the State to plan and produce the North Carolina Sustainable Economic Development Technical Assistance Forum for Mayors and Tribal Leaders. 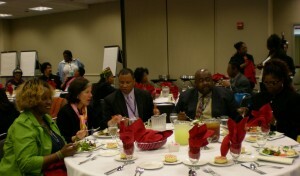 The Forum established a partnership with the objective of bringing additional sustainable economic development technical assistance, green economy resources and the means to create jobs to municipalities in the State especially communities that are challenged with poverty, high unemployment, health disparities and environmentally contaminated or under-utilized properties. SCDG planned and delivered two workshops in eastern and western Alabama on environmental cleanup as a catalyst for sustainable development. The workshops were convened in collaboration with the Alabama League of Municipalities, the University of West Alabama, Tuskegee University, Auburn University, the Department of Environmental Management and the Department of Tax and Revenue. This advanced learning opportunity engaged municipal officials throughout the State in peer learning and provided expert advice on financing and funding opportunities relevant to cleanup of contaminated brownfields and vacant properties; green infrastructure; healthy homes and buildings; energy efficiency; transit options; job creation and green jobs. 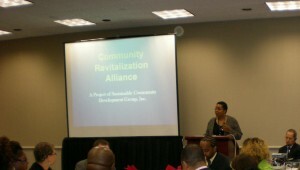 Two workshops for rural and small communities were designed, planned and delivered by SCDG at consecutive annual Small Communities Conferences in Philadelphia, MS and Vicksburg, MS. The workshops, entitled “Using Sustainability As A Tool For Economic Development,” educated mayors and other municipal officials and staff about federal and state governmental programs; creatively using a mix of development and environmental programs to meet site redevelopment needs; attracting private financing for the sustainable brownfields and land reuse process; blending traditional funding sources, tax incentives and green funding to make a project work; and focusing on strategies and best practices.